I’m back: an update and a plan. Let’s talk about America. Let’s talk about culture. I hate that I haven’t been able to regularly keep up with this blog. It’s just an issue of time: I run two other blogs on learning languages (Spanish and German) and am in the process of starting a third (French), had to spend a couple months last year (2016) writing the second edition of my book, The Telenovela Method (how to learn Spanish from popular media like TV and movies), an am now in the process of revising the aforementioned blogs to a more updated, user-friendly design. This is not to mention simultaneously learning Spanish, German, and French, as well as dealing with the usual unforeseen personal issues that pop up for everyone at what so often seem like the most inopportune possible times. It’s rather ironic that language-learning has prevented me from doing almost anything related to culture or the observation of it. As I’ve told many other people before, my personal reason for learning languages is so that I can communicate with and understand the people who speak it, their culture, their country, their history. This is what I’m actually interested in, not the language itself, by itself. There are such language nerds: they learn languages just for the sake of learning them, they like learning new grammar rules they’ve never seen before, they want more vocabulary to learn, not less. “Present perfect subjunctive”, “ibero-romance”, and “alveolar trill” are terms that excite them, not bore or scare them. These are the puzzle solvers, and I’ve no criticism or negative judgement of them, it’s just that I’m not one of them, that’s not my thing (at least as far as it concerns languages). I’m interested in people. 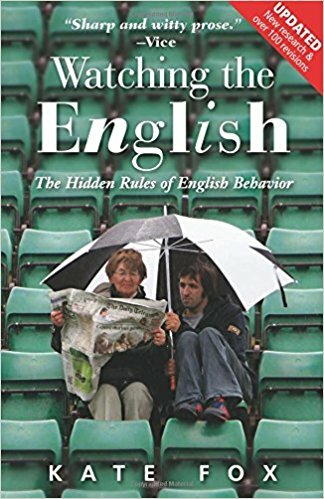 If you haven’t heard of Kate Fox’s book on English culture, Watching the English, I highly recommend you check it out. I finished it a little over a year ago and loved it, it’s right up your alley (if you’re reading this blog). She’s an anthropologist and a U.S.-U.K. dual citizen who’s been living in England for the past couple decades. She dissects the essence of English culture and specifically focuses on a few (I recall it’s something like five) fundamental characteristics of the English that she hypothesizes largely dictates their daily behavior. She zeros in on something she calls their “social dis-ease” (little play on words there, that is it’s both a disease in a sense as well as a lack of ease), which basically means they have poor social skills, and she believes that’s the single, underlying problem that causes so many others. Very, very interesting. If you’ve read it, tell me what you think in the comments.